A 90th birthday is a huge celebration! Many people do not have the opportunity to live to see this day. Make sure you show your warm birthday wishes for the birthday guy or gal with the Look Who's 90 Headband. This headband is a great way to make sure that everybody knows whose birthday it is. Every party guest will have their eyes locked on the new 90 year old. 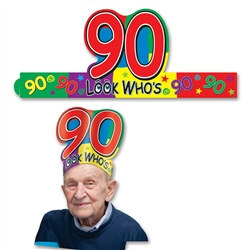 The Look Who's 90 Headband is made of printed cardstock material and has a fun multi-colored design. Make sure you pick up plenty of other supplies to help you celebrate a 90th birthday, like the 90 Cascade Centerpiece and the 90 Satin Sash.